Egnyte has been vying with the likes of Dropbox and Box for some time already in the cloud storage arena, but on Tuesday it jumped on board the "mobile-first" train with a newly revamped version of its enterprise-focused app suite that's aimed squarely at mobile business users. Now running on the Apple Watch and Windows tablets as well as Android, iOS and other Windows platforms, the new suite of apps is designed to let enterprise users on virtually any mobile device access, manage and share online and offline data from both cloud and on-premises storage. In addition to the expanded mobile-platform coverage, Egynte's new suite includes several new features, including the ability to organize files marked for offline access in a centralized view, thereby making it easier to coordinate offline and online content. Also new are the ability to name and rename files directly from a mobile device and a new dynamic-notification feature that can be set to track status updates in real time when large files and folders are being uploaded or downloaded at any location. Finally, high-resolution thumbnails and previews are now available to Egnyte users, meaning that they no longer need to download a file to get the highest resolution. 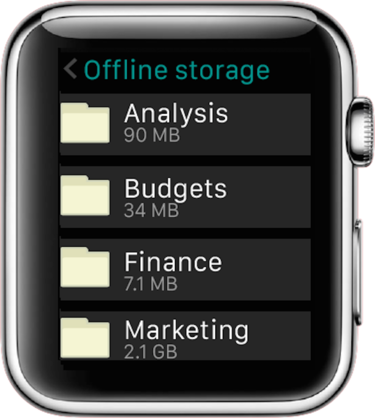 Specific to Apple Watch users are the ability to manage offline folders from the iPhone and monitor the status of uploads and downloads. Coming soon are event notifications when shared files are received, commented on or edited. Egnyte's new suite of apps also lets enables administrators add new users to the organization's domain and set permissions according to the required level of access, as well as adjust any permission from their mobile device. "Egnyte's enhancements are a logical step forward in supporting the latest tech and providing a compelling end user experience," said Terri McClure, a senior analyst with Enterprise Strategy Group. One of the company's biggest competitive advantages in its battle against competitors like Box and Dropbox is its ability to offer flexible deployment models for cloud, on-premises and hybrid environments, McClure added. A full 90 percent of companies have some type of data that cannot be stored in the cloud, according to Enterprise Strategy Group research, she said, while 93 percent of IT organizations are interested in enterprise file, sync and share services but want to keep some or all of their data on premises. "Egnyte has a strong solution," McClure said. "Its biggest challenge is getting visibility in a crowded market."